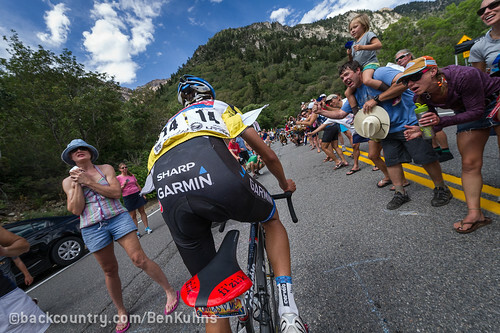 – Thanks to its 44,000 feet of climbing, the Tour of Utah bills itself as “America’s Hardest Stage Race.” In terms of absolutes, “America’s Loveliest Stage Race” might be another apt designation. It spanned the eerie, prehistoric, red deserts of southern Utah before reaching the skyscraping climbs of the Wasatch range. 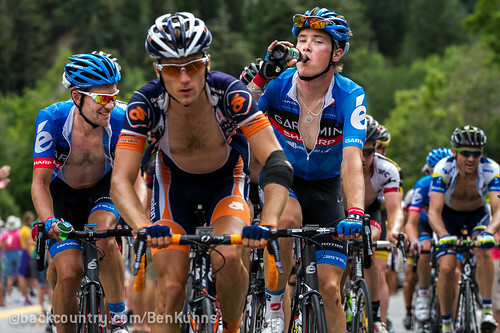 At the end, Tom Danielson stood victorious, in what was his biggest win since he took GC at the 2006 Tour de Georgia, though that win was clouded by — and later stripped — because of dopage royale. 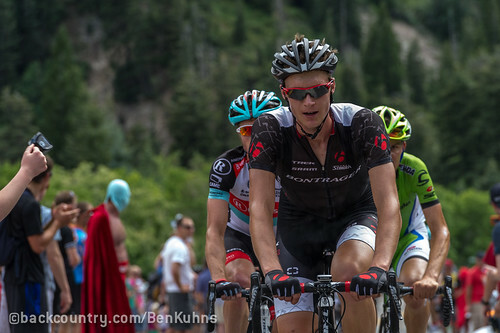 (1) If you’ve never seen the Tour of Utah live and you’re tempted to check it out, don’t miss Tanner’s Flat on the Little Cottonwood Road. 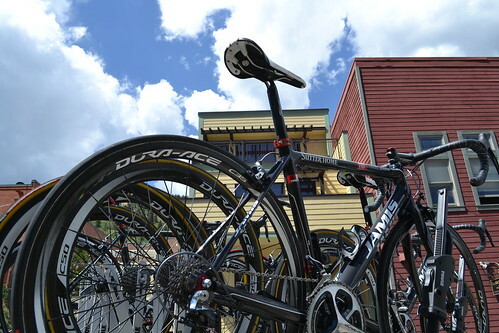 It’s about halfway up the climb to Snowbird. 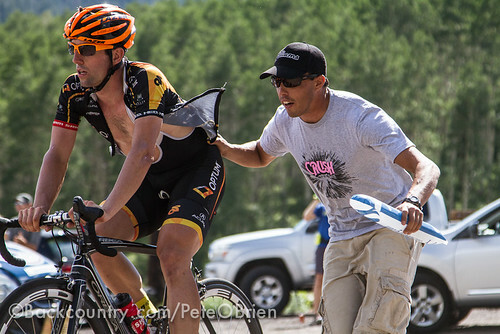 When the riders hit it, they’ve already climbed 9,000+ feet that day. You’ll see the stars of the sport go felonious on the laws of the gravity. 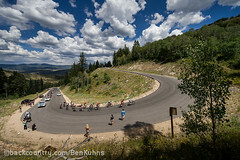 And then the rest — that is, 80 percent of the peloton — performs a high-altitude death march. 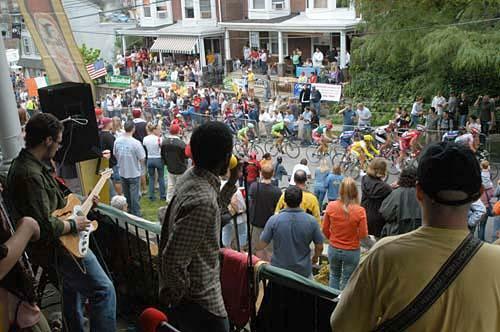 The crowd at Tanner’s Flat runs five-deep, proving to be the biggest roadside madhouse this side of the Manayunk Wall or Dutch Corner on Alpe d’Huez. The party is full-blown, and inevitably everyone outside the top 20 is considered part of the proverbial laughing group. How else can you describe the sight of Dave Z numbing the pain with Jello shots? 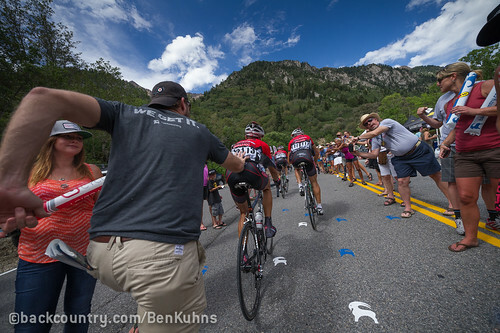 (2) The Utah crowd didn’t disappoint in what has mysteriously become every American’s patriotic duty: Jens Voigt adulation. It’s reached the point where an analytical fan must ask the question why? 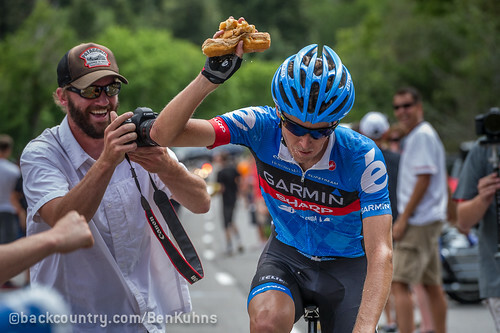 What did Jens do to earn such cultish worship? Is it karmic revenge upon America for having wrought a similarly senseless craze upon Germany in the form of David Hasselhof? Jens is swell, and his attacking style won him countless more decibels last week. But do his palmares support such outright mania? 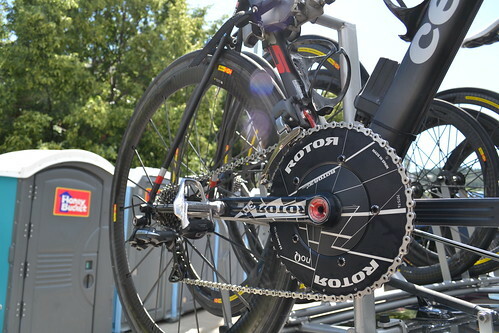 (3) Big time bike races deliver one thing like clockwork: Irrational product crushes. In order of least absurd to most: The flouro orange Lazer helmet worn by Optum, the Rotor cranks on the Garmin bikes, and the Jamis team bike. Jamis? How? Why? Just how low does the brand rank in consumer consideration? I don’t have answers, sorry, though I certainly have my suspicions. All I know for sure is that the bike ridden by its team might be the most gorgeous example of colorplay-on-carbon since the early generation Lampre Colnago C40. 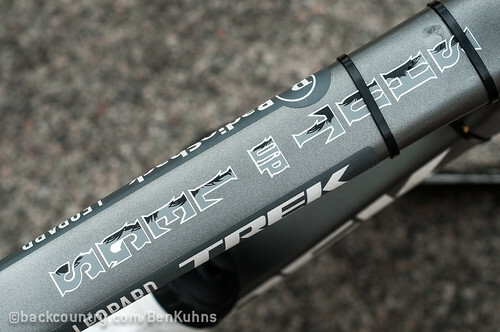 The Jamis had strategic bits of red anodization in a package that especially sang thanks to its battle-scarred Dura Ace tubulars. (Sadly, my photos don’t capture the beauty. Alas, epiphanies are never captured easily.) Add to the mix the suicidal descending employed by Javier Acevedo on Stage 6 to win his GC podium spot — what’s not to love? 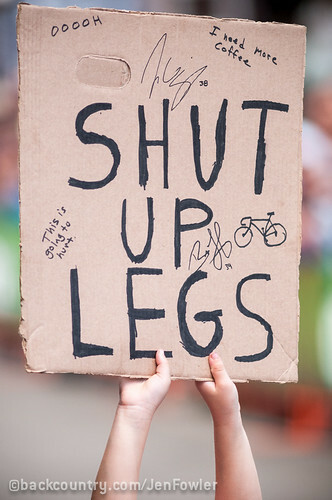 Jamis, send me a demo! Let me see if it rides as well as it sits. (4) Pro bike racing is good for a lot of things, arguably the greatest is how it introduces Americans to the zany poetry of Euro names. 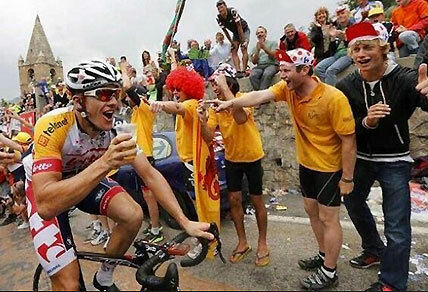 Who could forget the ferocious field sprinting of Twan Poels? 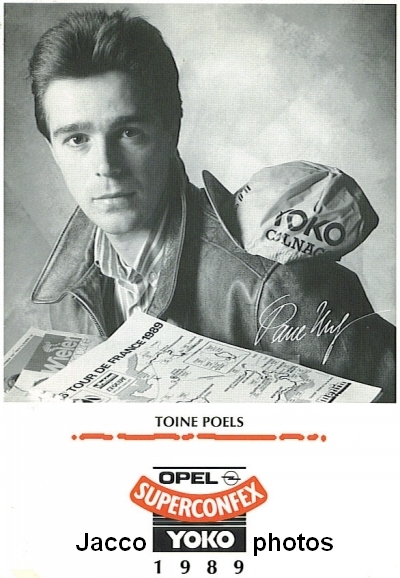 The Grand Tour near-prowess of Dutchman Teun van Vliet? The Classics tactical scrappiness of Jesper Skibby? I think I’ve named pets (fish, fish, cat) after each one. Introducing a new name to the pantheon: Andzs Flaksis. Not only will I name my next dog after him, but based on his gutsy ride in Utah, his palmares will doubtlessly soon extend beyond kicking the hell out of everyone in Latvia. 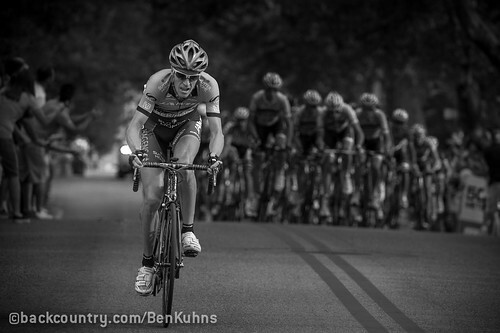 I say this not only because of his long solo break in Stage 2, but also for something he did a week before the race: I was on a Stage 6 recon ride with 10 or so PROs, culminating with the dreaded Empire Pass. Andzs happened upon our mini-peloton and joined us as we approached the climb. Of course I was at the back, where he pulled in alongside me. I made small talk to squash thoughts of defillibrators and such and as the road pitched up to its wall-like grade and he still chatted away I soon realized one of the most absurd things I’ve ever seen: He was chewing gum. PRO!